Had a last good trail run at Santa Rosa the morning I rolled away. Breakfast was a potato with cottage cheese and a jalapeño. Stopped at Jean’s on the way down route 66 and exchanged three more books. Easy drive down to Sumner Lake. It was partially cloudy when I got there and the lake was beautiful shades of green. The next day it was clear so the lake was back to its fabulous blue color. Really need to get a kayak. 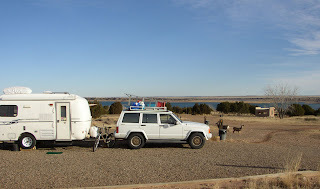 The Pecos campground is left open in the winter. Elevation is 4300’. It has thirteen sites, two of which are taken by host rigs. Once again, I was the only camper. Took an end-site along a hillside so Meadow and Onyx would have a place to roam away from the sites. Most days, the three of us went for a half-mile meander through the hills. These two are great company. The campground is way more open than I like but since it’s empty, it’s doable. The host said they were full a couple weeks ago for a week. Damn, is my timing good or what? Big honking light in the middle of the campground. Doesn’t do much for looking up at the night sky. 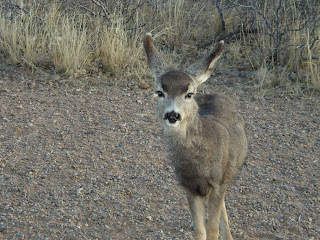 Each NM state park has sites designated “reservation”. If one is vacant, you can pull in and use it for a single night but then have to move to another site the next day, even if there is no reservation. In the winter season, some of the less frequented parks do not enforce this rule since there are so few campers coming through. Other parks keep the reservation policy in affect, even if there are only one or two rigs in the park. Reservation sites (with a pass) are $14 a night, every night, instead of only $4 a night. One also has to call the reservation number. The park’s office can not make the reservation. In most campgrounds like these, I only like two or three of the sites. It kind of rots if the other site is taken and the reservation site is sitting there empty. I approve of the policy for the summer season, but from what I have seen, there is not much use for it in the winter. I swear I have not been out of high winds for two days in a row in over a month. One day something blew into an eye and it took nearly a week for it to work out, dissolve, or whatever. The shower is warmer but not what I would call hot. Must be some bored deity up there having a little fun this winter. I hung a suet cage from the plant hanger mounted on the rear window frame and had a little problem the first night. It was after dark, all the lights were on inside, and all the blinds were still up from the day. I hear something up on the spare tire and Meadow, Onyx, and I all glance out the back window. There’s a raccoon out there going after the suet cage. I mean the camper is really lit up and we are only a few feet from himthat’s kinda ballsy. Anyway, I grab a flashlight but by the time I get out there, not only is the raccoon gone, but also the suet cage. Must have been somewhat cumbersome to haul it away since I had mounted two 6” dowels through it for bird perches. I look at the plant hanger and there is part of the chain hanging there. He broke the freakin’ CHAIN! Yeah, okay, it’s all yours buddyanything else I can get you? Good griefthe CHAINglad my throat wasn’t in his way. The next morning I found the nearly empty cage under a juniper not too far from the casita. It had the rest of the chain on it. The cage was snagged on a branch although I can’t see that being much of a hindrance for a raccoon. Sure seeing a lot of the Pecos River this route. Camped along it at Villanueva and Santa Rosa, drove along it down to Puerto de Luna, lost track of how many times I’ve crossed it, and here it is again. Surprised I have not come across old Bill. Bob, one of the hosts, has been here along with his wife in a class A for six years, year round. He’ll tell you all kinds of stories from his interesting life, from Korea to racing horses. NM host volunteers work 24 hours a week and get a free site and hookups, no salary. With an annual pass, one pays only $4 a night for a site with hookups. Volunteers work 96 hours for this $120. Hmmm. I really appreciate these volunteers or NM would not be able to offer the annual pass deal as it is presently set up. 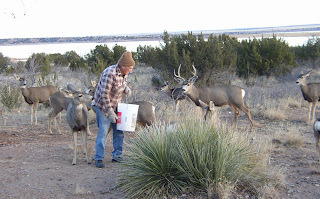 Anyway, each morning, Bob feeds the local deer with cracked corn. 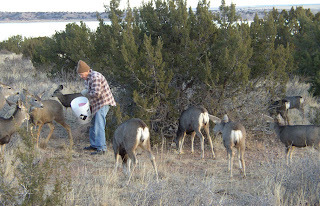 He’s out there with a pail and there are nearly twenty deer around him, like chickens. Unreal. His biggest problem is keeping the bucks away; they want to eat all the corn themselves. Sure hope the deer don’t wander out of the park; they are way too tame. Bob says wild turkeys also, often wander over, sometimes as many as twenty-five. 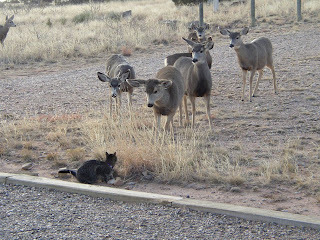 A number of times, deer came over to check out Meadow. There’s a nature trail along the lake and roads in the park for walks. Nothing in the way of hiking trails. There’s also a development northwest of the park that is worth a walk through. The park originally leased lots to low income people back in the forties. Ten or fifteen years ago the Bureau of Reclamation decided to sell the lots. It’s all dirt roads with some old funky homes. There are probably a dozen old trailers that have been incorporated into larger homes, fused right in. Take an hour for the walk, not all the dead end roads are marked so there will be a lot of backtracking but well worth it. There’s a mountain bike trail on the other side of the lake. It’s pretty technical. The trailhead is not marked but the trail starts behind site #30 in the East Side Campground. If one just wants to bike on dirt roads, continue past the East Side campground. Once past the second gate, you are back on park property with miles of dirt roads and double-tracks. One can also go back out on route 203 from the park and continue on. Practically no traffic. The two days I was riding along it, not one vehicle went by either way. The asphalt ends two and a half miles up and turns into a graded road which one can take all the way back up to Santa Rosa. Another camper, Jan, came in for a few days. He is traveling around New Mexico checking it out for a possible place to settle. I’m sure I’ll be running across him again in some of the other parks. Most interesting person I’ve come across in a while to talk with. Fort Sumner is sixteen miles from the park. The library has free wi-fi and a book sale table with 10 cent paperbacks and 25 cent hardbacks. There is a small Laundromat on the main drag. You want to use it when there is no one else there or you might not get a machine. On the next block is the Billy the Kid museum. Can’t quite see having a museum for a murderer. Different strokes. Probably geared towards those who decorate their walls with dead animals. Went into yet another grocery store that did not carry tofu. Guano. But what was even more surprisingthey did not have any fresh jalapeno! Isn’t that like against the law, sacrilegious, or somethingin New Mexico?! I mean, like, come ooonn! One day a Coachmen 16’ Shasta trailer pulled in. Nice design, I like the retro style. Looked very comfortable inside. 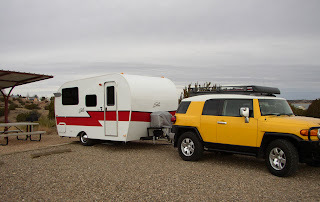 One thing that was strange was that the Shasta is designed to be all electricno propane. Tom mounted a 3,000 watt Honda generator on the tongue for when off the grid. Another thing is the smaller wheels to keep the vintage-look. Wonder how hot they get. The tires are also somewhat narrow so the load rating is probably lower. Trailer sure does look good, though. The casita finally dried out from all those months of heating with propane. I’ve been using DampRid but I’m going to order a small dehumidifier to dry the air when dry camping and doing long-term, cold-weather heating with propane. I really don’t like having mold in my living quarters. Definitely not healthy. January’s full moon is known as The Full Wolf Moon. Its name refers to the howling hungry wolf packs outside Indian villages in the cold and deep snows of midwinter. Once lost, can ne’er be found again.